On this day in 2007, Harry Redknapp launched a fierce tirade on the ‘filth’ ruining football. The Pompey boss felt the game was being wrecked by yobs aiming disgusting abuse at players and managers. Redknapp’s attack came in the wake of Sol Campbell being subjected to a tirade of vitriolic chants when the Blues played Spurs days before. The Pompey manager was subjected to verbal attacks from Aston Villa fans earlier that month himself. Redknapp stated he was sickened by what he saw as a growing tide of disgusting behaviour creeping into some sections of support at games. Speaking to The News at the time, he said: ‘Some of the things you hear are filthy. It’s filth – absolute filth. ‘There’s no place for it here. It’s wrong and I’ve got no time for it. ‘It’s not like football I know. You never used to sing filth. I don’t know how grown men can sing some of the things they sang at Sol. ‘I don’t know how they can do it. They need treatment. ‘I remember hearing some of the things said to Ronnie Rosenthal a few years ago about being Jewish. ‘I was sat there with my wife. It’s scary and not right. ‘They need a van to come and take them away. They shouldn’t be on the streets. ‘They can’t be right. You have to be mentally disturbed to do it. ‘There are kids there listening to it – there are women there listening to it. ‘I don’t know what you can do about it. It’s not all fans but something should be done. ‘How can you say these people are entitled to an opinion? What is the world coming to? ‘If you say something to them you’ll probably end up with a smack in the kisser. 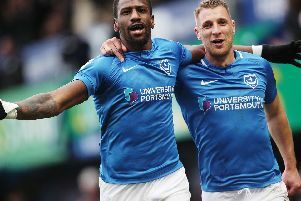 Pompey were preparing to face Liverpool at Anfield as they attempted to stretch their record-breaking away form. They were looking to make it seven away wins on the bounce – and eight in all competitions. And Redknapp was confident Reds fans would not reproduce the kind of abuse he had seen in recent weeks. He added: ‘Liverpool fans are fantastic and love their football. ‘I don’t see them coming out with some of the things I have heard lately. ‘No one loves a bit of banter more than I do. ‘I remember Peter Shilton was caught with a woman a few years back. He played against Liverpool that weekend and their fans sang at him to a man “Who were you with last night”. ‘That’s funny, that’s clever – banter. ‘Some of it makes me laugh. There’s some great wags about.